I think people like to see every part of a flower in focus so this may not do well. 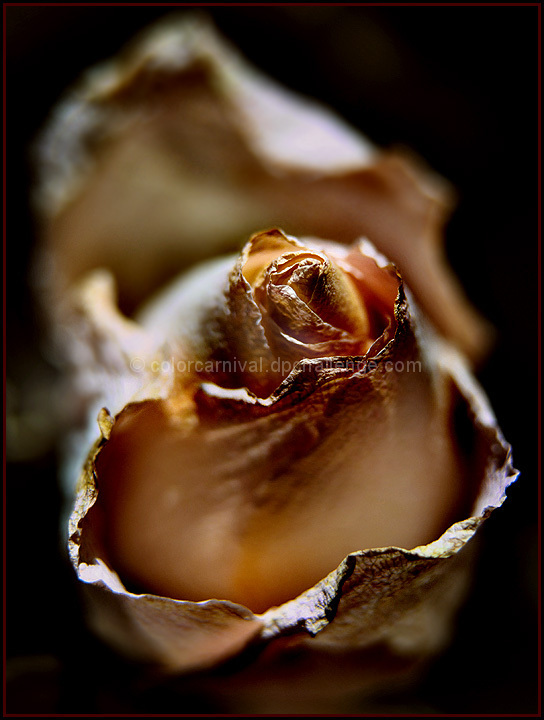 But what I liked was how the textures of the flower were emphasized in parts of the petals. Used my $10 extension tube again. More nifty hardware to add to your profile page, which is becoming way more colorful and interesting than those of the mega-ribbon winners. You really do know how to reach an audience - I stand in awe!! Oh, I so agree with Melethia's comment here! *grin* Nicely said, Melethia! I didn't vote on this challenge but when flipping through the photos I noticed this. It is so intimate, right there, can't look away - amazing effect. Very arty and most interesting. Just looking through the entries for the first time. Cool shot. I like how the tip of the bud is in focus, then it fades to softness below, then there is the unexpected petal edge in focus at the bottom. Beautiful texture and love the play of the light and shadows. Love the tones. Beautifully done. Very effective crisping of the edges by your colour and DOF. Nice. A bit more DOF would have shown some more details. Very nice use of shallow DOF. Proudly hosted by Sargasso Networks. Current Server Time: 04/19/2019 08:19:23 AM EDT.